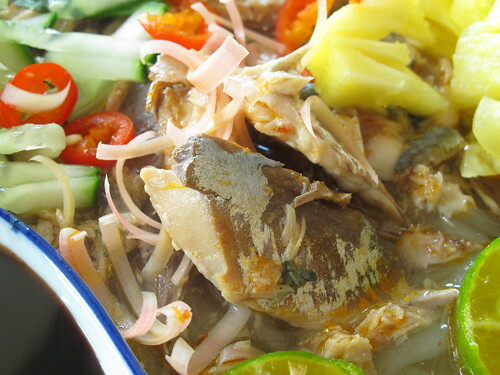 Actually this laksa is easy to make, the only tricky part is picking the flesh out from the fish..
My mom taught me to use small size of kembung fish as it has better fish aroma.. 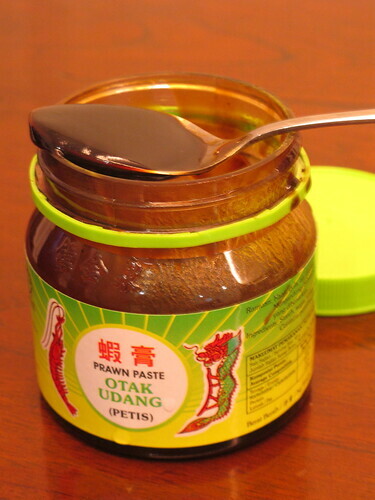 This is one of the most important ingredient that you should not missed, Hae Ko/ prawn paste..
i like to eat the fish flesh in pieces, so i did not boiled the fish stock for too long..so you can see the stock i prepared is quite clear and not that thick,,you may adjust the cooking time as per your preference..
1. Blend chilli paste, shallots, galangal, lemongrass and belacan till fine paste. 2. 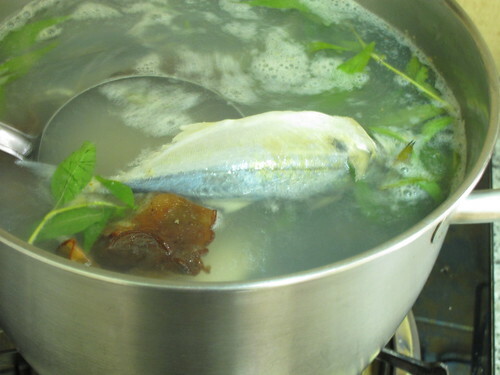 Bring water to boil, put in fish, daun Kesum, and tamarind peels. 3. 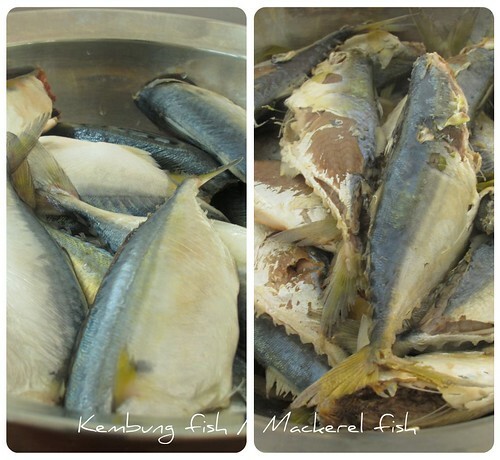 Cook for 10mins, remove fishes from the stock and set aside to cool. Set fire to low and continue to boil for another 10mins. 4. Pick the flesh out of all the fish and discard the bones. Break the fish meat into tiny pieces. 5. Strain the stock in another pot. 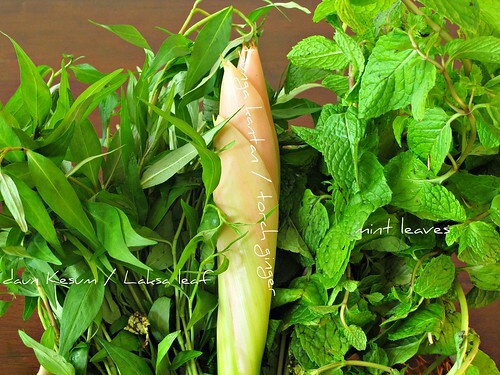 Remove daun Kesum and tamarind peel. 6. Use the same pot, heat oil and sauté blended spice paste till aroma, add in the fish stock and cooked fishes pieces and few cooked tamarind peels, continue to boil for 45mins over low heat. 7. Add in seasonings, and adjust the taste accordingly. 8. 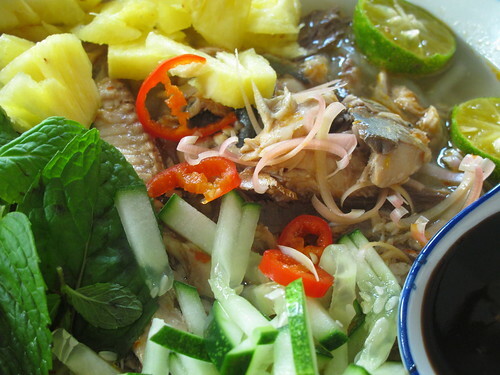 In a serving bowl, add in the Laksa noodles (blanch in hot water first) and garnish all vegetables on top. 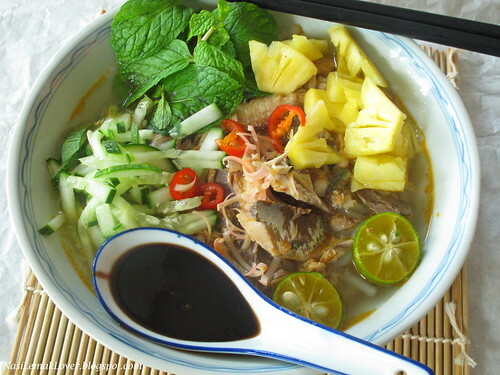 Pour the Assam Laksa soup into the bowl and serve immediately with a spoonful of Hae Ko/prawn paste. just looking at the photos already make me saliva drooling...... This is one of my favourite! I love assam laksa very much. So mouth watering by looking at this..very delicious! 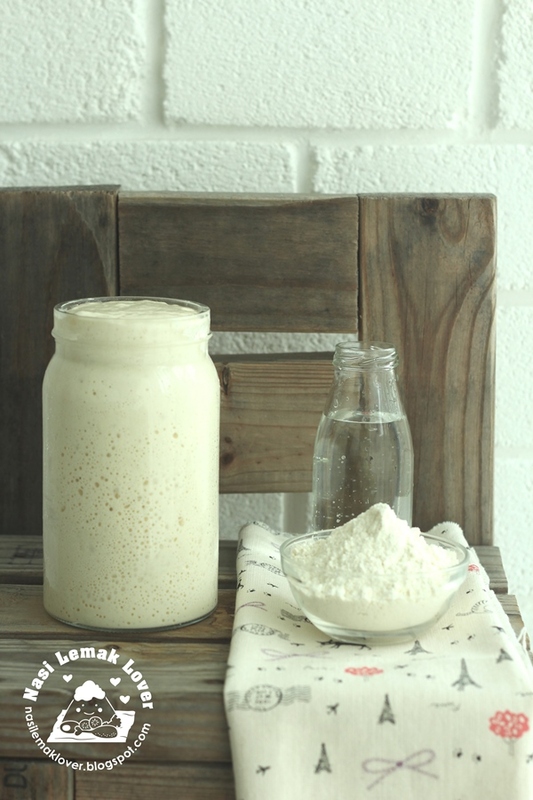 these well known dishes to easy to make at home!!! So wish for a bowl of this tasty tangy soup. I must try this. I can never find any good Penang Asam Laksa in Singapore. I like to eat the fish flesh in pieces too. Yummy!!! I just can imagine the taste *sigh* ;D You make us drool , Sonia ! hahaha Gorgeous photos , too ! Yours look good! I didn't get a chance to try Penang Laksa during my recent cruise trip there. Sweet n sour Penang laksa is my favourite. It has been quite sometimes not having it. Yours look very yummy! Look so sedap! I used to be able to buy heiko here but I have not seen it these days. 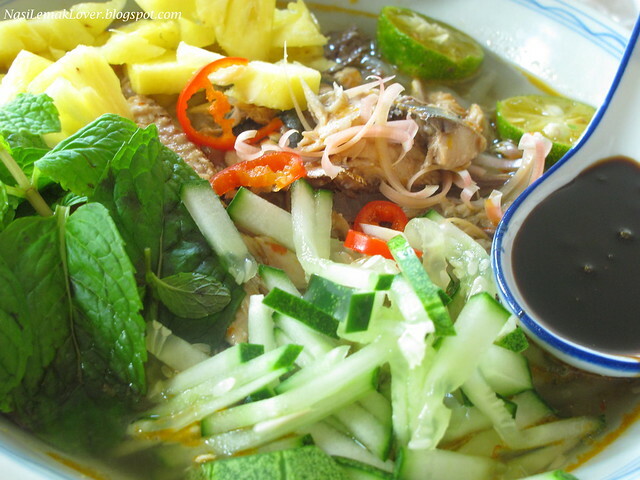 Assam laksa is one of my favorite, feel so hungry, drooling now..
sonia, i think you're going to make everyone salivating reading your post here! Penang- best laksa.. my favourite.. i always have 2 bowl. Oh boy this looks like quite a bit of work! But looks so yum, sure worth it. 😄 Plus I've not eaten it since I've come bk to Sg, sure miss it a lot! But thanks for the recipe Sonia! looks different n unique dish..
Assam laksa is definitely my all time favourite! This is my favourite Penang fare! Thanks for both delicious entries Sonia! Sonia, now that I'm so close to Malaysia and only wish that I could pay a visit!!!! Never tasted the joy of this dish but I'm sure it's phenomenal. It sounds like it has very complicated flavor in a bowl and looks tasty too! 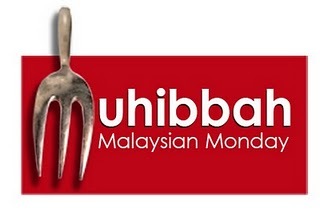 When kids are a bit older I want to take a detour and enjoy culinary adventure in Malaysia/Singapore. I super love Penang lakes but it's hard to find a good one in Singapore. looks yummy.......can i have one? Drooling...I have not eaten laksa for almost a year. Thinking about making it. But went to market yesterday and the seafood price are high. Because it is close to Christmas. I am salivating just looking at your photos...this is my favorite laksa and always choose this over other types of laksa! u know ma....tis one is my top favourite!!! Not only is this the most beautiful dish of food I've seen...I can see all the loving care that takes place in making it. Your ingredients are beautiful as well. The best dishes come from using good, fresh, local ingredients! I wish I was there to taste it. all your cooking making me drooling big time here!! wish I can have a big bowl of Assam Laksa here!! your claypot is calling my name too!! hahaha! Penang Laksa is one of my favourite!! 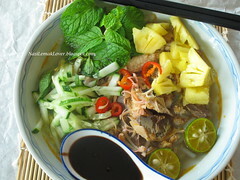 Really salute u, make laksa from the scratch...and ur laksa makes me hungry. oh, MY, I want to try that!! Oh I absolutely love assam laksa! Wish I could have that bowl of it! I absolutely loved assam laksa. My must eat whenever I go back. Sonia, what an authentic dish that you've made here. I'm salivating! Sonia!!!! Congrats and I am drooling at this Penang Laksa and your /Fragrant Claypot Pork belly With the salted fish...I want both !!! This is one of my favourite hawker food. Looks absolutely delicious! I would usually ask for more chili padi from the hawker! Yum! yummm! I love this dish! Totally agreed with the top 10 yummiest food! This looks really good and appetizing. I love this but no chance to cook it as my kids don't like. Hi Sonia, L loves asam laska. wow... yours look so tempting and delicious. Lovely presentation too. 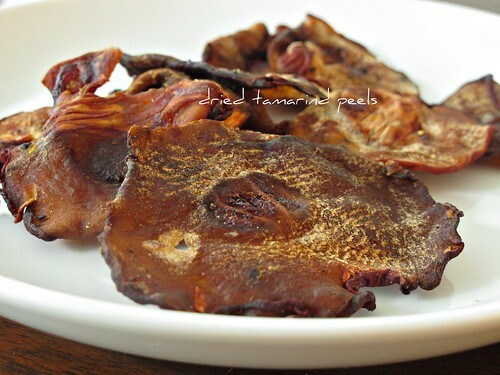 The dried tamarind peel is looked like asam keping or the Indonesian calls for asam gelugur. Is that correct? I don't think I have tasted enough Assam Laksa. Back in Singapore, it is usually the coconut-based laksa that is common. But I always like spicy tangy noodle soup. A good bowl of this traditional Laksa can cost quite AUD$15 or more at Melbourne. I think you will make good business if you sell your yummy food at Melbourne. I would like to take this opportunity to wish you and your family a Merry Christmas and best wishes for 2012! This is in my to-make list too! Looks so good! Merry Christmas Sonia! Yum! I know I would love this, it really sounds delicious and is so colorful! Merry Christmas and Happy New Year!!! Yum yum yummmm....this is my favourite! I think I am the only one loves it in my family. haha...But sometime it's hard to find the perfect one. Hope you're having a wonderful time and also wishing you & your family a very Merry Christmas. Have load of fun & laughter. Just wanna drop by and wish you Merry Christmas;p.
I can see why this is one of the ten yummiest foods....Wishing you and you family a Merry Christmas! Oh my goodness, I am so hungry just looking at this. Have not had assam laksa for such a long time, cannot wait to try it out! Nice Blog. Enjoyed your recipe. BTW, Have you tried the assam laksa at a new outlet called Penang Xpress at KL Festival City mall in Setapak or Aeon jusco Rawang. Great assam laksa and curry mee. Give it a try .